If your CPA has not approached you yet about year-end tax planning, you may have to approach them to get the ball rolling. -Max retirement plan contributions – if you don’t have a retirement plan in your business, look into getting one. If you do, max it out. -Buy assets – this is an easy one…you can generally write-off 100% of the cost of business assets purchased. However, be sure you need to. Oftentimes, in our quest to reduce taxes, we take big deductions. But if income will be higher next year, it may make sense to defer those purchases and/or deductions. -Do a projection – this is so simple and often overlooked. 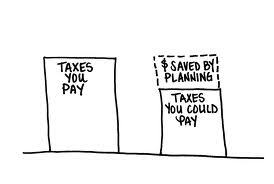 Run a tax projection to see where you stand so you can prepare and make moves now. Pay in some estimated taxes to reduce penalties and interest if need be. Bottom line is don’t put your head in the sand. Tax is like death…we are all going to face it, so you may as well be prepared for it!